Genome analysis reveals that North African date palms are a hybrid between cultivated date palms from the Middle East and a different, wild species of palm that grows on the island of Crete and in small areas of Southern Turkey. These findings, the result of research at NYU Abu Dhabi's Center for Genomics and Systems Biology (NYUAD CGSB), shed new light on the evolutionary history of one of the earliest domesticated tree crops in the world, which remains a major fruit crop in North Africa and the Middle East. Previous studies have shown that while dates from the Middle East and North Africa belong to one species - Phoenix dactylifera - the date palms from these two regions are genetically different. The distinct nature of North African dates, which include such popular date varieties as Medjool and Deglet Noor, has led to questions as to how they originated. There have been suggestions, for example, that North African date palms may have been domesticated independently from date palms in the Middle East. To solve the mystery of the origin of North African date palms, the researchers at NYUAD, and working with colleagues from NYU in New York and researchers in Greece, France, Switzerland, and the UK, sequenced the genomes of a large sample of date palms from Middle East, North Africa and South Asia, as well as palms from related but distinct wild species. The genome analysis found that hybridization between date palms and P. theophrasti, a species known as the Cretan wild palm found in the Eastern Mediterranean, is the source of the mixed ancestry and genetic distinction of North African date palms. The researchers have shown that 5-18% of the North African date palm genome is derived from the Cretan wild palm. The hybridization of Middle East varieties with wild Phoenix theophrasti has led to increased genetic diversity in North African date palms compared to date palms from the Middle East. The hybridization with P. theophrasti may also lead to new genes being introduced to cultivated date palms that could help in providing better date palm varieties, including for disease resistance and yield. 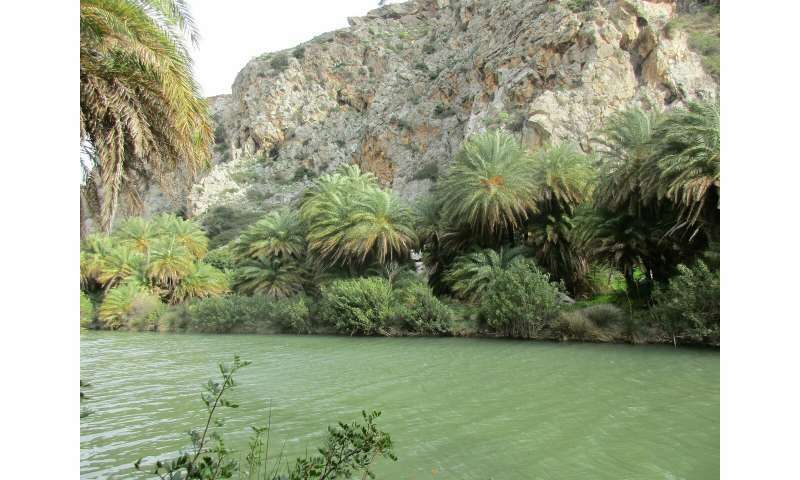 Today, P. theophrasti is found in 10 populations in the island of Crete, with a population near the popular beach resort of Vai considered to be the largest palm forest in Europe. It is also found in small populations on various islands in the Aegean Sea, in mainland Greece, and Southern Turkey. Although this species looks similar to the cultivated date palm, the fruit of P. theophrasti are thin and fibrous and are generally inedible. The International Union for Conservation of Nature (IUCN) classifies P. theophrasti as "near-threatened" in status, which indicates that this species, while not an immediate cause for concern, may find itself threatened with extinction in the near future. Based on these findings, the NYUAD researchers suggest that date palms were initially domesticated in the Middle East, possibly in the Gulf Region. Certainly the oldest archaeological evidence for Phoenix dactylifera is found in Dalma Island in the United Arab Emirates, and in Kuwait, during the Arabian Neolithic Period about 7,o00 years ago. However, in the movement of the domesticated date palms from the Middle East, P. dactylifera encountered populations of Phoenix theophrasti when they reached the eastern Mediterranean, and hybrids between these two species then led to the origin of the date palms that now grow in North Africa. Based on archaeological evidence, the hybridization that created the North Africa date palm likely took place approximately 3,000 years ago. These results were reported in the paper "Cross-species hybridization and the origin of North African date palms" published in the journal Proceedings of the National Academy of Sciences. Much of the work was done by Dr. Jonathan Flowers, a research assistant professor, under the direction of Michael Purugganan, Silver Professor of Biology and Dean for Science at NYU. This research was undertaken as part of the Date Palm Genome Diversity project led by Purugganan. The project's goal is to learn more about the traits and evolution of the date palm through analysis of the plant's genome, both to help understand how date palms have originated and evolved and also to help future efforts at agricultural improvement of this important fruit crop. "As we continue to unlock the secrets of the date palm here at NYU Abu Dhabi, we can contribute to figuring out how crops have evolved, and also maybe identify important genes that can help develop new varieties that can ensure our food security," said Purugganan.